A lovely chakra finish jhumka as a stud and dome gives this earring a very royal look. 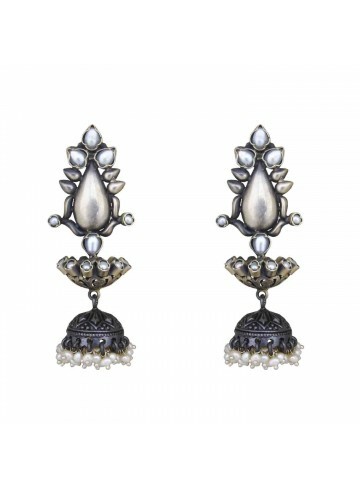 You're sure to love wearing this oxidised jhumka. 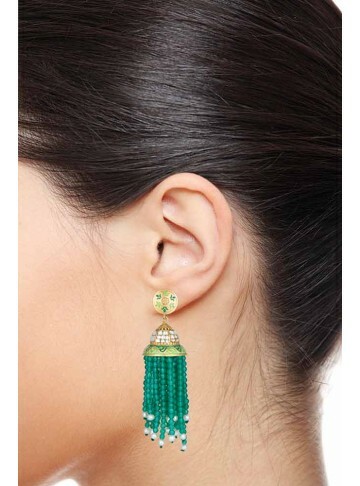 A stunning jhumka with green onyx tassels at the bottom. Don't miss the beautiful green meenakari stud and the kundan work bell shaped drop. This jhumka is completely handmade and takes the artisans days to string the beads together at the bottom in alignment. Truly a statement piece this wedding season! 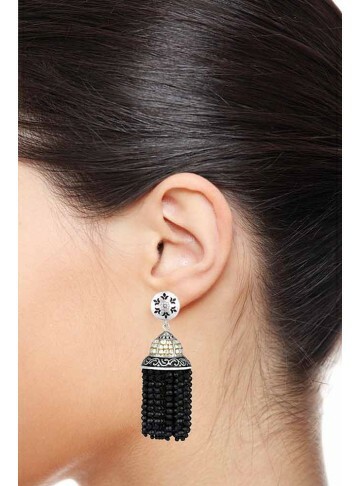 A stunning jhumka with black onyx tassels at the bottom. Don't miss the beautiful green meenakari stud and the kundan work bell shaped drop. This jhumka is completely handmade and takes the artisans days to string the beads together at the bottom in alignment. Truly a statement piece this wedding season! A stunning jhumka with white pearl tassels at the bottom. Don't miss the beautiful blue meenakari stud and the kundan work bell shaped drop. Don't you think the Indian Jhumka would have looked amazing on the Egyptian queen, which is why we decided to combine paisleys, zircons, and the jhumka and create a masterpiece. 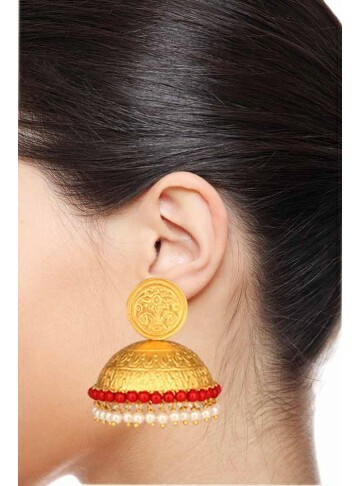 We would have loved to see Cleopatra wear one of these Jhumkas. This contemporary dome-shape jhumka detailed with ethnic geometric motifs go perfect together. The elegant pearls and turquoise stones are an excellent contrast on the golden sheen. This Traditional Grandeur Golden Maharani Jhumka is a gold plated silver accessory handmade in pure 925 Silver. Style Tip: Wear it with a kurti or silk saree while you showcase your jhumkas beautifully. A handcrafted nagas stud of a peacock, a mesh like circular ball, and a bell shaped jhumki! Just the perfect style to add an ethnic touch to your outfit. A gold plated nagas jhumki with a red onyx and pearl. The beautiful carved peacock stud adds to the beauty of this jhumki! A few things stay in trend forever. Jhumka is one such piece of art! It also has the power to be this “one little thing” that can make you feel unique! Traditionally a part of South Indian jewellery, the ageless Jhumka earrings have been in vogue for many years. Today, Jhumkas are a fashion statement and a collection item in every girl’s jewellery box. Be it a casual day, party or wedding, Jhumkas complete the accessorial combination in style. MirrorWhite’s high-quality collection consists of classic as well as modern jhumkas. 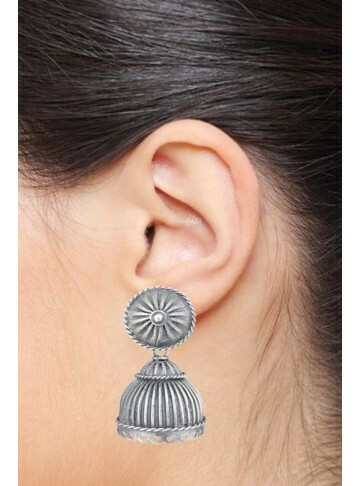 As for your everyday wear, you can always go for Silver Jhumkas to enhance your look. The small jhumkas that are out-of-the-world will surely make it difficult to decide. Be itthe fancy oxidised jhumka, black onyx quartz jumki, dangler multi-lined step Jhumka or meenakari pink jhumki, you will certainly find your perfect match right here! The golden jhumkas are a collection of irresistible earrings for any grand occasions. The impressive kundan mango shaped paisley jhumkas is simply unmatched. The evergreen traditional coral bell jhumka demand a special mention not only for its gorgeous design. The incredible presence of festive earrings like statement enamel step jhumka earring & traditional South Indian red onyx jhumki are a level above the rest. Buy these silver jhumkas online that would go well with both Indian and Indo-western attires offering an exclusive blend of a contemporary style with a traditional outfit. Each Jhumka is intricately handcrafted to perfection by world-class artisans. 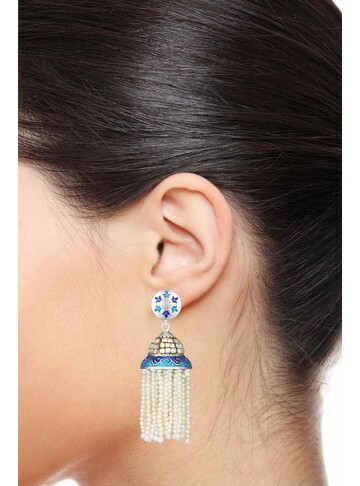 Every elegant Jhumka earring is affordable. MirrorWhite showcases the best assortment of irresistible earrings, so buy them online from MirrorWhite and make your online shopping experience totally worth it! 1. What is a Jhumka? Jhumkas or Jhumkis are traditional chandelier earrings with the droplets in the shape of a dome or bell. 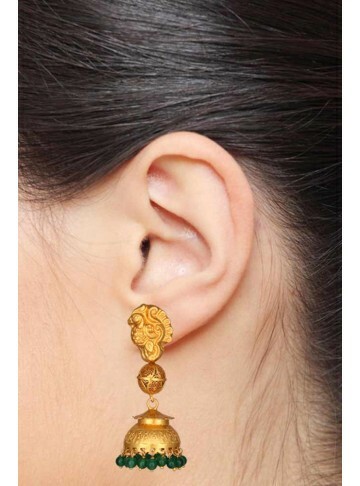 These earrings (Jhumkas) look antique and trendy at the same time! Jhumkas are known for its intricate patterns and designs. Silver, Kashmiri, Meenakari, Crystal, Pearl are few of the exotic jhumka collections. 2. 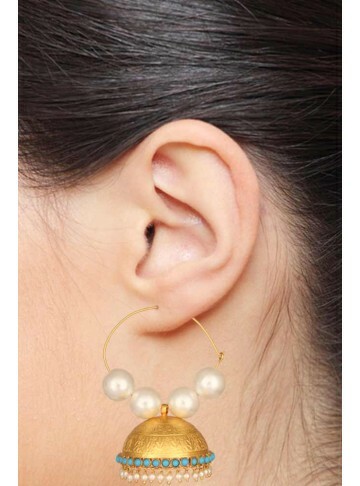 Why do women love to buy jhumka earrings online? Every Indian girl’s jewellery collection seems incomplete without Jhumkas. Here is the never-ending list of reasons why women love to buy jhumkas online.